Africa is the issue of the moment. As Tony Blair puts Africa's challenges at the top of the agenda for the G8 summit this July, organisers of the Live 8 concerts are increasingly calling for the doubling of aid and the cancellation of Africa's debt. But some serious thinkers believe that charity is killing Africa, creating a culture of dependency and lining the pockets of dictators. The only solution, they say, is to stop giving handouts. In the long term, literally billions of lives might be saved by stopping aid to Africa. But in the short term, is it worth the pain? The final programme in this IF series of drama documentaries coincides with the BBC's Africa season. This is a controversial debate with vocal and powerful arguments on both sides. 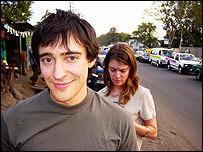 The story begins with reports of the murder of aid worker Ben Swales in Northern Uganda by the Lord's Resistance Army. The programme then takes a retrospective look at his life, starting with his first encounters as a child with charity television appeals, followed by his visits to Africa as a photojournalist. Ben then moves into aid work, and we witness his growing disenchantment with the charity world and his increasingly vocal opposition to it. Fictional interviews with Ben's family and friends, shot back in London, reflect on what motivated him and how he viewed Africa's problems. But mixed with these are interviews with real experts arguing both sides of the coin. Through this, the programme reveals the failure of aid across the continent: for example the charity which would only feed people who converted to Christianity, and the refugee camp in Rwanda which was used as a military base to commit atrocities. In this fictional scenario, by 2015 a number of African countries have grown tired of the dominance exerted over them by the West, and have rejected its aid. But what would an Africa where all aid has ceased really be like?